No limit hold'em has become the dominant poker variant worldwide. Strategy books for it are everywhere, training sites focus on it heavily, and the WSOP NLHE Main Event draws thousands of entrants every year. But for those looking for something a little different (or a new game to beat), there are many other poker variants out there -and one of them is badugi. Badugi is a drawing game that is similar in structure to triple draw, but each player holds four cards instead of five. In addition, the hand values are different as well. There are three drawing rounds, during which each player may discard zero to four of the cards from their hand, and then draw the same number of cards. There is a betting round before each drawing round, and one betting round after the final draw. Badugi is commonly played as a limit game, but can also be played as pot limit, half-pot limit, and no limit. The object of the game is of course to win money by having the best badugi hand at showdown (at the end of the final betting round), or by betting and having everyone else fold. A badugi hand contains one, two, three, or four cards of distinct suits and ranks. That means you can't have cards of the same suit or rank in the same hand. So if you have two clubs, or two sixes in your hand, it's not good. A four-card badugi is the best type of hand. This has four cards of different ranks and suits. The three-, two-, and one-card badugi hands are ranked progressively worse. In the event that two players have the same number of cards in their badugi, the winner is determined by the rankings of the cards, with the lower rankings being better. The "low" hand is counted from the highest-valued card in each hand, where aces are low. In the case of a tie, the second highest card is used, and so on. Players always make the best badugi hand they can using their four cards. Let's look at some examples to see how it works in practice. Example 1: Let's say that Joe and Bob are the only two players to make it to showdown and they both flip over their cards. Let's say that Joe has the four-card badugi 9♥8♣5♦2♠, and Bob has the three-card badugi 7♣6♣2♥A♦. Even though Bob has the lower-valued cards, Joe wins because he has a four-card badugi, while Bob has only a three-card badugi (he holds two clubs in his hand). Example 2: Joe and Bob again make it to showdown. This time Joe has T♣T♠7♥4♦, and Bob has Q♦J♥4♣2♠. Even though Joe has cards of four different suits, he has the T♣ and the T♠, which are the same rank, so they cannot be in the same badugi hand. So he only has a three-card badugi. Bob has a four-card badugi, so Bob wins. Example 3: Joe and Bob once more make it to showdown, but neither of them have a four-card badugi. Joe has T♦8♦6♥2♠, and Bob has T♣9♣5♦2♥. To decide whose hand is best, the players create the best badugi hand they can. Joe has two diamonds in his hand, but to make the best three-card badugi, he uses the lower-valued one. So Joe had a three-card badugi 8♦-6♥-2♠, while Bob holds 9♣-5♦-2♥. The highest card in Joe's three-card badugi hand is lower than Bob's, so Joe wins. Example 4: Joe, Bob, and George all make it to showdown. George has J♦T♦5♥2♠. Joe has T♠T♣4♥2♣. Bob has K♥T♥4♠2♦. We see that George has a three-card badugi because he has two diamonds in his hand – so he has T♦-5♥-2♠. Joe has a three-card badugi because of the two tens in his hand, giving him T♠-4♥-2♣, which beats George's hand. Bob has a three-card badugi because he holds two hearts, giving him T♥-4♠-2♦ as well. Joe and Bob both have the three-card badugi T-4-2, which beats George's T♦-5♥-2♠, so Joe and Bob split the pot. As with all forms of poker, badugi is a game of incomplete information, and acting last will always give an advantage. If you play in position you will be able to make more money with your very strong hands, get away more easily from weaker hands, and pull off occasional well-timed bluffs more effectively. While position is important, it's perhaps even more important to play strong starting hands. Playing too many hands is one of the most common mistakes that beginning players will make. You should only play starting hands that are likely to give you the best hand at showdown, and often it is a good idea to play hands that can win a hand without improvement. For example, a hand like Ts4c3dAs has far more inherent value than Ts9c7d5s. Both hands are three-card badugi hands already, and have the same chance to improve to a four-card badugi hand, but in short-handed games, a three-card badugi will often be the winning hand. So it's very important to have low cards as the part of your hand that you won't be discarding, since the odds of improving from a three-card badugi to a four-card badugi within your three draws is only about 50%. You'd like to have a good chance to win the hand without improving your hand with your three draws. As a rule of thumb, don't play any one- or two-card badugi starting hands. Stick to three-card badugi hands with low numerical ranks (ranks 6 and lower for the three cards you'll be keeping is ideal). In many situations it will be very obvious which cards you want to discard – the highest numerical rank of a non-distinctly suited card in your hand is always a good place to start. But sometimes you will get hands like 5c5d4s3h which can be frustrating – in this example, discarding either five is equally good, since there are the same number of diamonds and clubs exposed. If you do not immediately see what the best drawing decision is when you are first dealt your hand, it is likely that you should simply fold your hand before the first draw. There is a betting round before each drawing round, as well as one after the third draw, which means there are many opportunities to make decisions about whether or not to bet, and how much, or whether to raise, call or fold. Experience is the best teacher for this, but if you are playing tight starting hands pre-flop, it will almost always be correct to open the pre-draw betting round with a raise, since most of your opponents will be playing a wider range of starting hands than you. After that, a lot of it comes down to watching how many cards your opponents draw, and figuring out what you can conclude from that. If it is only you and a single opponent making the first draw, and your opponent discards and draws two cards, this will usually indicate that the opponent began the hand with just a two-card badugi. 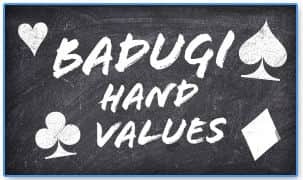 It is hard to improve a badugi hand quickly, so if you started with a three-card badugi hand before the draw and haven't improved, you will very often still have the best hand after the first draw. In the end, it all comes down to paying attention, knowing your opponents, and understanding how the hands change with the draws – and most of that will come with observation and practice. Badugi is a fun, unique variant of poker in which the basic rules still allow for a variety of interesting and complex situations to arise during play. 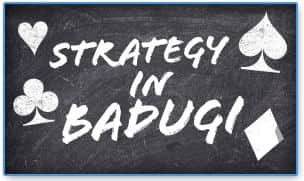 Badugi is also a great game because it is one of the lesser-played types of poker, and most people who play it do not use good strategy, which allows for a significant edge for anyone playing a basic strategy of solid hand selection, value betting, and position. Learn how to play - learn how to win! Learn about odds and outs in this great article. Learn to build a 'roll and move up in stakes! Improve your game and win more cash.